Lord, Break Through on the Border! 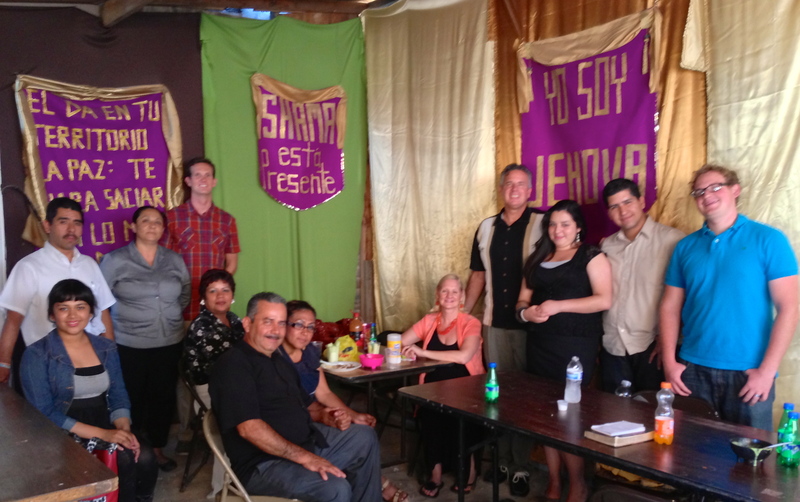 David Jr., Dawn and I had a wonderful Sunday afternoon with our friends at Lo Mejor del Trigo in Mariano, Tijuana. One of our friends from Harbor, Matt Dolstein was also able to join us. 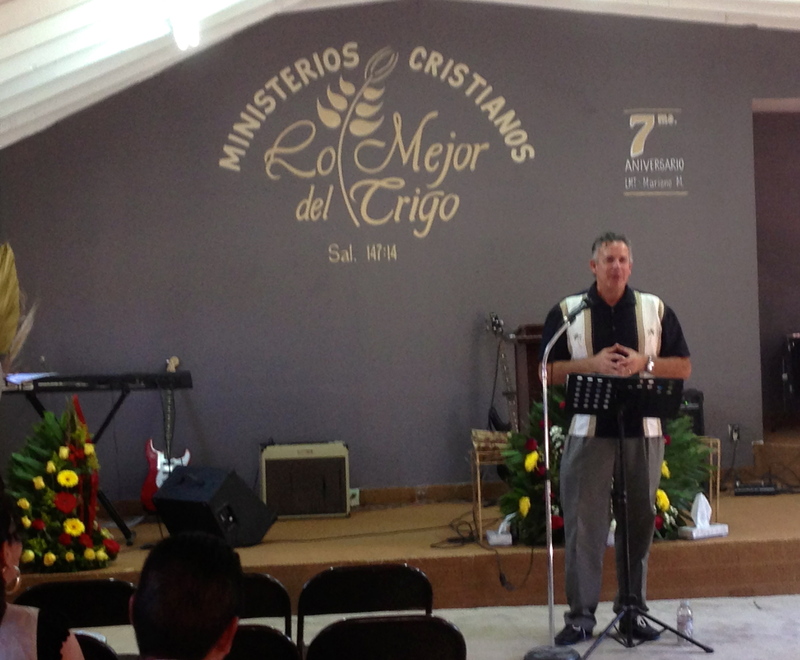 Pastor Mauro Lopez, who leads the church has become a great partner in ministry. We’ve enjoyed getting to know him, his family and those that are part of the church he leads. Today (Sunday) I preached at the church. I love being able to encourage the people. This church has been going through some tough times. I felt as I shared with them today that they needed the Lord to meet them in a special way. David, Dawn and I prayed that God would lead me as I preached, and touch the people. Several years ago I read that right before Charles Spurgeon would preach he would repeat to himself, “I believe in the Holy Ghost, I believe in the Holy Ghost, I believe in the Holy Ghost.” I keep that in mind and make it my prayer before I preach. This prayer is a cry to the Lord to minister through me and his Word, and also a reminder that I am dependent on the Holy Spirit to touch others. A friend of mine sent me an article this week that warned of ministers today forgetting to rely on the Holy Spirit as they minister. The author brought up some valid concerns. My brethren, we are in desperate straits in the Evangelical and Reformed world. The church is generally impotent, tame, and woefully lacking in effecting the culture in which we live. I urge you to read the Scriptures afresh and anew, looking at, believing in the ministry of the Spirit. See how many times in the Book of Acts the Spirit is mentioned. I urge you to read Calvin’s Institutes, John Owen’s work on the Holy Spirit, Revival by Lloyd-Jones, and Scotland Saw His Glory by Richard Owen Roberts as a cursory study of the issue. And then let us pray, seeking God until we find Him. He finishes the article with these penetrating questions, Are we given to unbelief? Do we doubt the power, efficacy, and immediacy of the Spirit? If so, may we repent and believe. My prayer is that we will believe in the power, efficacy and immediacy of the Spirit, and that we will see the power of the Spirit break forth as we seek and serve the Lord on the border. The Lord has been teaching Dawn and me more about his desire for the gospel to penetrate deeply into our lives. Luther, who God used to spearhead the reformation, stated that “we need to beat the gospel into our heads.” He also said, “all of life is repentance.” Good reminders! For some reason we forget the power that gospel has to change our lives as well as the lives of other. Look to Jesus with us, and may we repent and believe. Not having a true church “home”, I have been to many sermons, and, on occasion, I have felt that the preacher/pastor/priest was just going through the motions. My friend would look at me perplexed when I asked if it was alright if I didn’t come back. I believe that there are people of “the cloth” that lose that reason they opened their church. They get caught up in calendar events, how much has been tithed, and the next sermon, and somehow their conviction to God gets lost in the mundane. I don’t fault them. It is easy to get caught up in trappings. We all need Christ and the gospel every day whether we are a minister or not. I can’t say I always enjoy it, but God keeps taking me deeper. It is painful to see and deal with our sin, but I’m grateful for the cross of Christ.